Courtesy of Berkshire Hathaway HomeService, Sue Turner. Enjoy cool ocean breezes in this beach close Niguel Coast home. Walk or Ride your bike along the Monarch Beach Golf Links to Salt Creek Beach and Strands!! This home is truly turn key and sparkles with the pride of ownership throughout! Exceptionally clean with Quality appointments throughout; four bedrooms two and a half baths. Tastefully upgraded and decorated with crown moldings, neutral paint, upgraded bathrooms, beautiful wood flooring and carpet. Newer A/C and furnace. Three car garage. Light and bright interior with separate formal living and dining rooms. Open kitchen with warm wood cabinetry and breakfast area. Cozy fireplace in the family room which opens to a tranquil back yard in which to relax or entertain. Perfect for indoor outdoor living. Master bedroom with large private balcony. Home boasts of new dual pain windows, door hardware, light fixtures…One bedroom is currently being used as an office with custom built in cabinetry. Prime sought after location near world class beaches, five star resorts, golfing, hiking and walking trails. 1 mile to the sand! Minutes to Dana Point Harbor and quaint Lantern District. Biking trails that take you thru wood canyon all the way to top of the world Laguna each! Walk to Blue Ribbon School John Malcom. 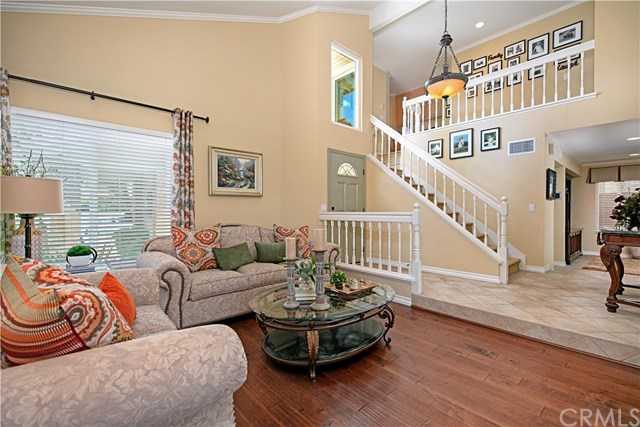 Convenient to Ocean Ranch shopping, Cinepolis, transportation and respected private schools. Truly coastal living at its best! Spoil yourself and your family with this beautiful home and the best location in Laguna Niguel! Please, send me more information on this property: MLS# OC19083149 – $999,000 – 32332 Ridgeway Avenue, Laguna Niguel, CA 92677. I would like to schedule a showing appointment for this property: MLS# OC19083149 – $999,000 – 32332 Ridgeway Avenue, Laguna Niguel, CA 92677.